Citation Information: J Clin Invest. 2007;117(2):397-406. https://doi.org/10.1172/JCI29417. SH2B1 (previously named SH2-B), a cytoplasmic adaptor protein, binds via its Src homology 2 (SH2) domain to a variety of protein tyrosine kinases, including JAK2 and the insulin receptor. SH2B1-deficient mice are obese and diabetic. Here we demonstrated that multiple isoforms of SH2B1 (α, β, γ, and/or δ) were expressed in numerous tissues, including the brain, hypothalamus, liver, muscle, adipose tissue, heart, and pancreas. Rat SH2B1β was specifically expressed in neural tissue in SH2B1-transgenic (SH2B1Tg) mice. SH2B1Tg mice were crossed with SH2B1-knockout (SH2B1KO) mice to generate SH2B1TgKO mice expressing SH2B1 only in neural tissue but not in other tissues. Systemic deletion of the SH2B1 gene resulted in metabolic disorders in SH2B1KO mice, including hyperlipidemia, leptin resistance, hyperphagia, obesity, hyperglycemia, insulin resistance, and glucose intolerance. Neuron-specific restoration of SH2B1β not only corrected the metabolic disorders in SH2B1TgKO mice, but also improved JAK2-mediated leptin signaling and leptin regulation of orexigenic neuropeptide expression in the hypothalamus. Moreover, neuron-specific overexpression of SH2B1 dose-dependently protected against high-fat diet–induced leptin resistance and obesity. These observations suggest that neuronal SH2B1 regulates energy balance, body weight, peripheral insulin sensitivity, and glucose homeostasis at least in part by enhancing hypothalamic leptin sensitivity. 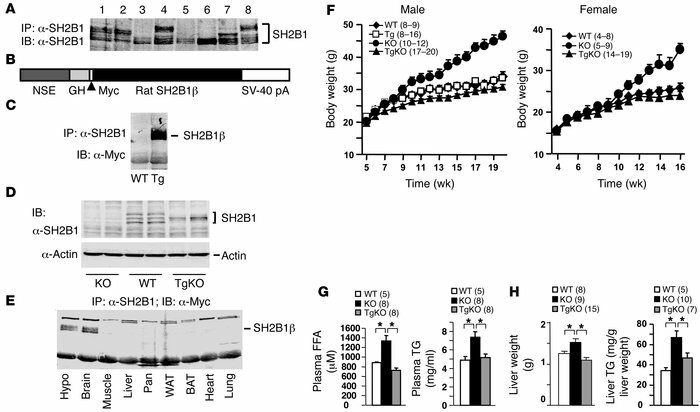 Neuron-specific restoration of SH2B1β rescues obesity and hyperlipidemia in SH2B1KO mice. (A) Tissue extracts (2 mg protein in hypothalamic and 3 mg protein in other tissue extracts) were prepared from WT mice, immunoprecipitated with α-SH2B1, and immunoblotted with α-SH2B1. Lanes 1–8 represent tissue extracts from spleen, pancreas, heart, hypothalamus, muscle, liver, white adipose tissue, and brain, respectively. (B) Schematic representation of the Myc-tagged SH2B1β transgene. (C) Brain extracts were prepared from an SH2B1Tg mouse and a WT littermate, immunoprecipitated with α-SH2B1, and immunoblotted with α-Myc. (D) Brain extracts were prepared from WT, SH2B1KO, and SH2B1TgKO-437 mice and immunoblotted with α-SH2B1. Each lane represents a sample from 1 mouse. (E) Tissue extracts were prepared from the hypothalamus (Hypo), brain, skeletal muscle, liver, pancreas (Pan), white adipose tissue (WAT), brown adipose tissue (BAT), heart, and lung from an SH2B1TgKO-437 female (16 weeks old); immunoprecipitated with α-SH2B1; and immunoblotted with α-Myc. (F) Growth curves for WT, SH2B1Tg, SH2B1KO, and SH2B1TgKO-437 mice. Number in parentheses indicates the number of mice per group. (G) Levels of plasma FFAs and TGs in males (17 weeks old) fasted overnight. (H) Liver weight and TG levels in mice (21–22 weeks old) fasted overnight. *P < 0.05.